This product was added to our database on Monday 24 October 2016. The 2nd Tactical Air Force was formed in 1943 to support the ground forces in the coming invasion of Europe. Following the D-Day landings units relocated from the United Kingdom to the Continent. The Hawker Typhoon fighter bomber was a mainstay of the close support squadrons in the campaign in North Western Europe. It was a heavy hitting, versatile aircraft capable of carrying both bombs and rockets. Drop tanks and bombs were not carried at the same time, although rockets and tanks could be if the rockets were limited to the two outboard mounts. The decal options cover aircraft from 439 (Canadian) SQN & 183 SQN RAF and the personal aircraft of Wing Commander R.T.P. Davidson, CO of 143 Wing, Royal Canadian Air Force. 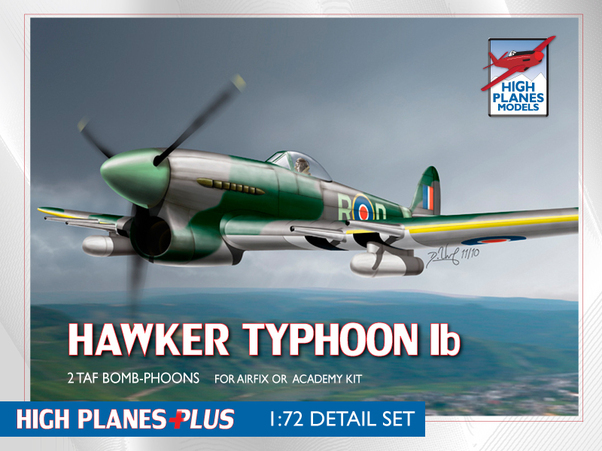 This detail set is designed to work with the Airfix or Academy Hawker Typhoon Ib kits With some adjustment it may be adapted to other kits.